I am going to start by stating that I haven't read the first book, so I have no frame of reference to compare it to. And also I have no idea what might be a spoiler. So consider yourself warned. 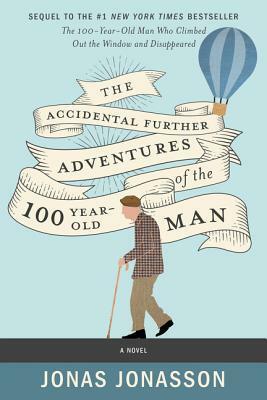 I chose to read The Accidental Further Adventures because it looked like a fun, wandering book that just sort of made jokes with all the most serious political situations going on. Some irreverent fun sounded exactly like what I needed, honestly. I'm pretty sick of serious politics. And at first, that's what it was. I was a bit put off by the occasional foul language, but moving beyond that (and ignoring the backwardness of these men's moral compasses), I rather enjoyed the first bit. It was fun to see them stumble into North Korea and figure out a way to slip back out. The sense of humor isn't entirely my style, but I still found it humorous and enjoyed watching things play out. Really, I stopped enjoying it as soon as they get to America. When President Trump appeared and acted like an utter imbecile, I got uncomfortable. When the gag is stretched out, and everyone keeps agreeing that it's best to keep him in the dark about everything, and a massive political issue is basically just shoved under the table to Angela Merkel and the Europeans are basically like "it's better to just sort this among ourselves," that's when I went from uncomfortable to offended. I put the book down and googled, and sure enough, the author is a Swede. And I'm always happy to read books from diverse perspectives. I'm all for getting the international angle on things. Thus the fact that I am typing this in my Scottish dorm room. But I get enough smug Europeans looking down their noses at American politics during the day, I don't need it in my literature as well. And really, I started skimming from that point on. I dipped back in when they got invested in a coffin painting business, because that was an interesting quirky storyline, but that quickly soured for me as well once the extended plot device/gag about an order for a Nazi graffiti coffin started. I'm sorry, I just can't get behind the use of literal Nazism and white supremacy for a quirky plot device. And I realize that may just be the difference in American vs Swedish senses of humor, but for me it was the last straw. I skipped to the end and was done. I do not recommend this book. I did not really enjoy this book. But if you have read my review and think that none of the things I've mentioned would bother you, then go ahead and read it. See what you think for yourself. Maybe let me know in the comments if you get something out of it that I don't.